A chargeback is the return of funds your customer paid to you via an ePayment (credit card charge or bank draft). A chargeback can happen if your customer disputes a purchase made using their credit card or bank account. When they dispute the purchase, the credit card company or bank involved may ultimately reverse the charge, reimburse the customer in full, and take the amount back from your organization's bank account. Fraud/No Authorization - These represent the majority of chargebacks. Fraud chargebacks are disputes where a customer's payment information was stolen and used without their knowledge. No Authorization chargebacks are dispute situations where the customer does not believe their payment information was compromised but they do not recall authorizing the transaction or they don't recognize a transaction on their statement. Cancel Recurring Billing - The customer believes they cancelled recurring billing by notifying you or were not aware they had agreed to recurring billing. Products/Services - Chargebacks regarding product or service disputes can be due to varying circumstances such as damaged or defective goods, services not provided, or goods/services were not received. Other - Representing a small number of chargebacks, these situations can vary and include disputes over amounts charged, payments made by other payment methods (duplicate payments), and disputes regarding the liability shift from the move to EMV technology. If you are notified that a chargeback has been initiated, contact your bank or merchant processor right away. Many banks will go ahead and process the chargeback if a merchant doesn't respond in the allotted time. If you are hit with a chargeback you will need to adjust the family's account. How this is done is dependent on the merchant processor and whether or not they update the gateway with the chargeback status on a payment. If the processor has not communicated the chargeback to the gateway you can use the R (refund) icon on the disputed payment to record the return of the funds. This 'refund' transaction will not be sent to gateway, you will opt to refund with a different payment method to simply record the repayment of funds on the family's account. From the Transactions tab of the Family record, Click R on the disputed payment transaction. In the Refund Transaction window click the Refund by Different Payment Method button. In the Warning window select Record Refund in Jackrabbit Only. Select a Refund Method. You can add payment methods (e.g. Chargeback) from Tools > Edit Settings > Drop-down Lists > Payment Method. Select the disputed fee and click Next. Because the family has disputed the fee and will not be paying it, choose Not Due in the Are Fees Still Due? window. The chargeback will be recorded in the family's record and their account balance will remain unchanged. 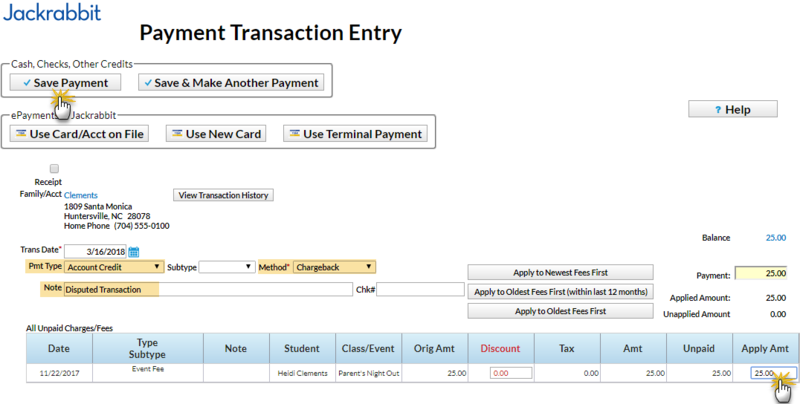 For accurate revenue reporting the original payment transaction is now linked to the fee refund and the original event fee is linked to the refund adjustment. When a chargeback has been communicated to the gateway, you will not be able to use the R (refund) icon. When Jackrabbit sends the query to the gateway as to the payment's eligibility for a void or refund, a response is received and a Void/Refund Error will display advising you that the payment is pending. When you click OK in the error window you are returned to the family's Transactions tab. In this case you will record a debit adjustment (like a fee) on the account and link it to the disputed payment. This will leave the original fee showing as unpaid and you will then record a credit adjustment (like a payment) to clear that amount owing. If they do not already exist in your database, you will need to add Adjustment (Debit) and Adjustment (Credit) Transaction Types in your drop-down lists (Tools menu > Edit Settings > Drop-down Lists). From the Transactions tab of the Family record, click the link icon on the disputed payment to unlink it from the fee. 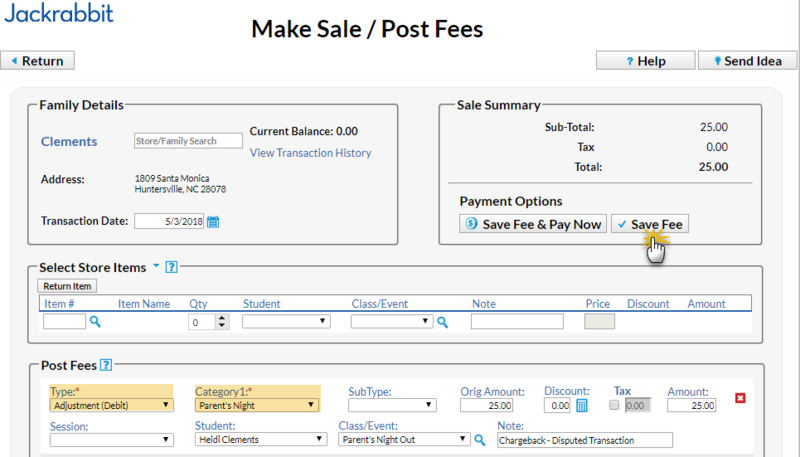 Click Make Sale/Post Fees and post an Adjustment (Debit). Use the same Category1 value as the fee that was disputed. Click the link icon on the disputed transaction again and reapply the payment to the Adjustment (Debit) transaction. Click the Payment button in the family's record. Use a Pmt Type = Account Credit and Method = Chargeback and select the disputed fee. These drop-down values can be added from Tools > Edit Settings > Drop-down Lists >Transaction Types and Payment Methods respectively. For accurate revenue reporting the original payment transaction is now linked to the debit adjustment (fee) and the original event fee is linked to the credit adjustment (payment).